In the deserted darkness of outer space it is hard to visualize we are anything but alone in the universe. But picture for a moment that we are not alone, but in fact one of an infinite number of parallel universes that comprise infinite descriptions of ourselves. In one cosmos you might be president of the United States, while in another you could be made of jelly. 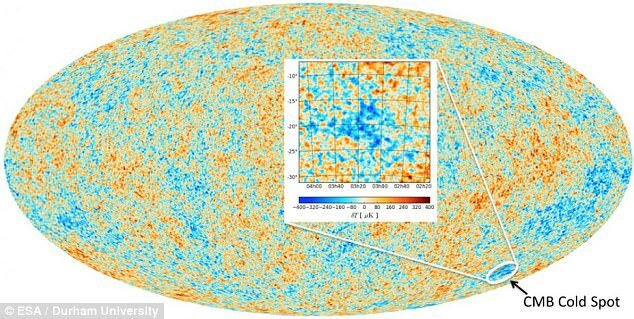 This is the theory of the 'multiverse', and a recent study has establish that a mysterious 'Cold Spot' in space could prove our universe is only one of an eternal string of realities. For years, researchers have been confused by the Cold Spot, which measures around 1.8 billion light years across. 'We can't entirely rule out that the Spot is caused by an unlikely fluctuation explained by the standard model [of particle physics],' said study coauthor Professor Tom Shanks, an astronomer at Durham University. 'But if that isn't the answer, then there are more exotic explanations. 'Perhaps the most exciting of these is that the Cold Spot was caused by a collision between our universe and another bubble universe. If true, the Cold Spot could reveal that our cosmos contains an infinite number of parallel universes containing an infinite number of realities. 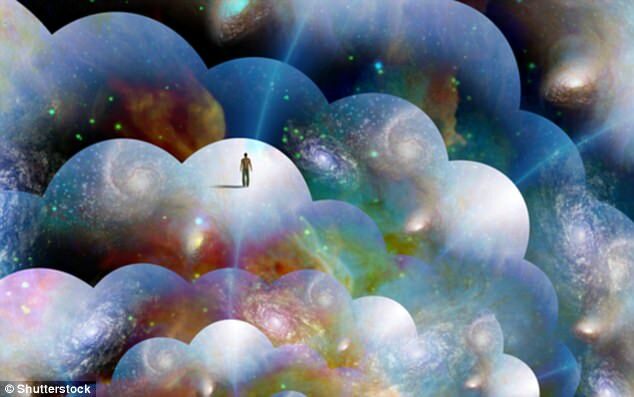 'These uncountable realms sit side by side in higher dimensions that our senses are incapable of perceiving directly,' astronomy expert Dr Stuart Clarke wrote in the Guardian. The Cold Spot was produced when the universe formed more than 13 billion years ago. It was first spotted by NASA’s WMAP satellite in 2004, a sighting that was later confirmed by the ESA's Planck mission in 2013. Rather than the Cold Spot existing as a single, massive supervoid, the new study suggests galaxies in the spot cluster around smaller voids that spread over the region like bubbles. But these clusters of galaxies cannot explain the Cold Spot's lower temperature. In order to prove that the clusters are responsible for the anomalous Cold Spot, the researchers say a non-standard cosmological model is needed. 'But our data place powerful constraints on any attempt to do that,' said study lead authorRuari Mackenzie. The study's simulations show there is only a two per cent chance that the Cold Spot formed randomly, meaning - multiverse or not - there is plenty more research to be done on the mysterious region.